Home Events #ArtLotto launches today! Keep your eyes opens and look out for all sorts of art around you, because your next post about art could be your ticket to P450,000! #ArtLotto launches today, October 15, across the nation. A project by Publicis JimenezBasic, E. Zobel Foundation, 4As Creative Guild of the Philippines in collaboration with artists and other art institutions, #ArtLotto is a public service effort that aims to make people be more conscious of the art around, and eventually, help them become richer -- both their pocket and their mind. This idea started with an observation that actually there is an abundance of art in the Philippines. You can find art everywhere in the Philippines. It’s in underpass tunnels, along highways, in coffee shops and restaurants, in offices, in schools, on streets, practically everywhere. But most Filipinos pay no attention to art because it has no value to them. The truth is people have more basic needs. So the difficult question was how do you make them notice something they find so irrelevant? By making them see its value in a way they’re most familiar with, through something they really value, using a medium Filipinos line up for every day – the lotto. This project wants to democratize something that seems to be very elitist, and tries to make art more inclusive instead of exclusive. And ultimately, it intends to make people be more conscious of art everywhere. 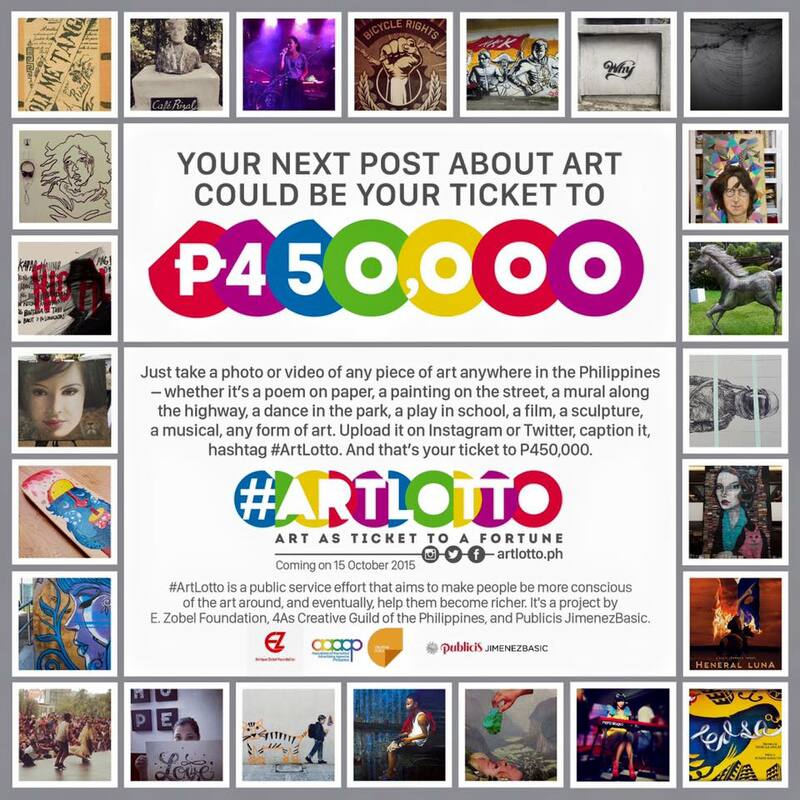 #ArtLotto is a project by E. Zobel Foundation, 4As Creative Guild of the Philippines, and Publicis JimenezBasic. It was the recipient of the Diwa Award through the E. Zobel Foundation. What are you waiting for? Snap away!